The International Space Station (ISS) is a huge (>400 tonnes mass, >900m3 pressurized volume) habitable satellite on low earth orbit. It orbits the Earth at about 400km high with a speed of 7.67km/s (27,600 km/h), and goes around it in about every 93 minutes. It's permanently crewed, can support up to 6 astronauts, and provides a platform for many scientific experiments. Besides astrobiology, astronomy, materials science, and many other fields, it hosts experiments for the ARISS - "Amateur Radio on the International Space Station" project. 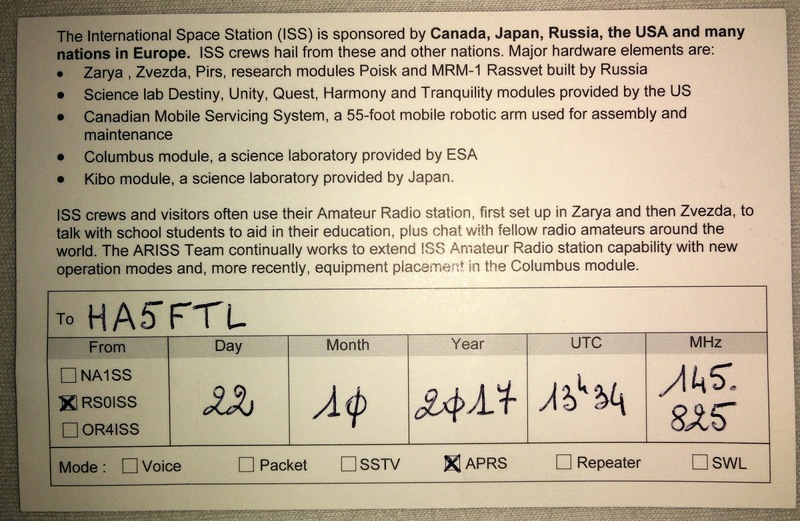 ARISS experiments give opportunities to observe or even contact the station with simple amateur radio equipment. There are various activities onboard that can be monitored, or taken part of with relatively simple equipment. No large parabolic antenna and automatic tracking is needed. At the time of writing this post, the ISS is 403 Km high. The figure above shows how it's distance can be calculated when it just appears on the horizon. At that time, it is merely 2300 Km away. This is the maximum distance we need to cover. 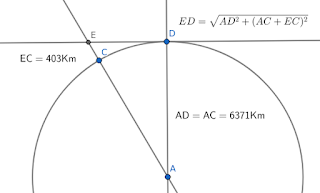 The calculation goes like this: D is where we stand, E is the ISS, C is a point directly under it, A is the centre of the Earth. Earth's radius is about 6371 kilometres. 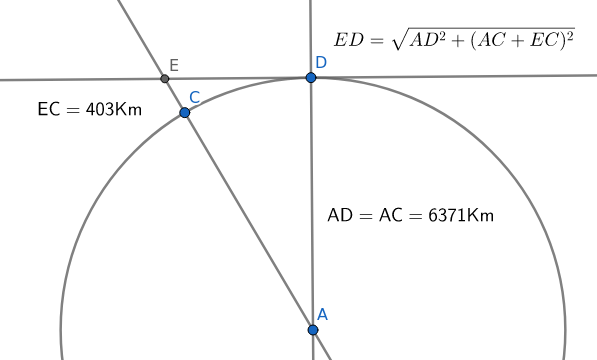 The AD radius is perpendicular to the plane tangent to the Earth's surface at point D. E is being on the horizon, ED is perpendicular to AD, so AED is a right angled triangle, the distance we need to calculate is ED. AD is known, AC and EC, therefore AE is also known. Pythagoras will do the rest. In practice, you only want to try and contact / listen to the station when it is at least 10-15° up, and it is somewhat closer. That does sound like a great distance. However anyone who participates in amateur radio knows that such a distance can easily be covered with a couple, or couple of dozen watts of power and cheap antennas even on the shortwave bands and with skywave propagation. Since the ISS is high above, there's nothing between us to shield the signals. 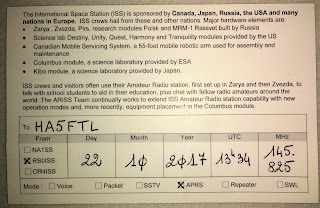 The ARISS experiments are usually working on the 2 meters (145 MHz) and 70cm (433 MHz) bands. It is quite practical to build or buy good directional antennas for these bands. A Yagi-style one with a reflector and two directors yields excellent results on 2 meters, a few more on 70 centimetres is probably a good idea. The mode of operation on these bands is almost always FM, so a simple handheld transceiver (or scanner) will do the job just fine. I use my Kenwood TH-D72E. This is a more pricey HT, and it's a very good one, but a cheap one would also do OK.
All in all, what you really need is a handheld radio or scanner, a portable (not too large) Yagi antenna for the band, and you're good to go. ...but what can you do with it? Astronauts sometimes use simple FM radio to keep contact with the ground crew in Russia on 143.625MHz. The astronauts onboard often participate in events called "school contacts". 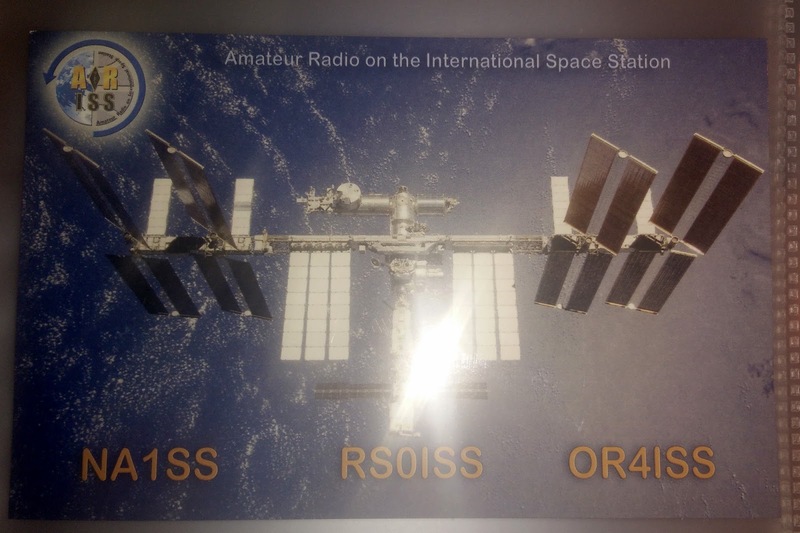 During such an event a radio link is established between a school and the ISS. If the contact is voice only, then it is often made at 145.800 MHz, and can easily be listened to with the setup described above. Note that during the event only the ISS can be heard, the school will very likely be out of range - to be more precise - be obstructed by buildings, hills, or the curvature of the earth. 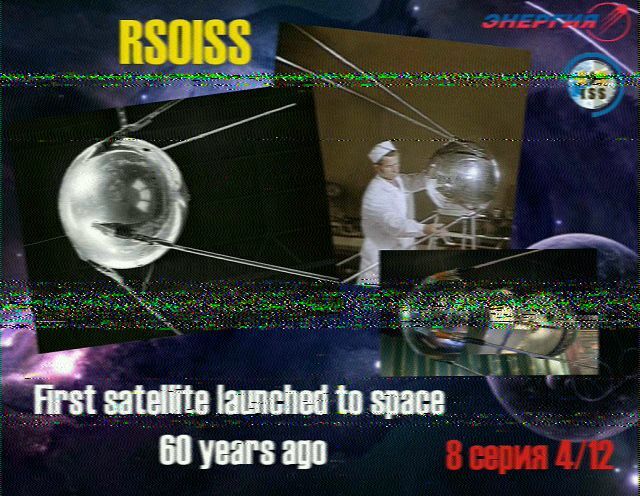 On special occasions the ISS transmits images at 145.800 MHz using FM and SSTV, often in the PD180 mode. 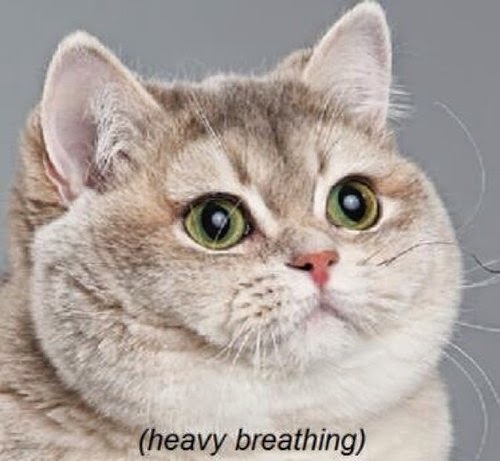 An SSTV image is just a burst of sound of almost musical quality. To decode it and turn the sound into an image, the radio must be connected to a computer or smart phone, and a decoder program must be running. I use a SignaLink USB device (http://www.tigertronics.com/slusbmain.htm) to connect my handheld Kenwood TH-D72E radio to my Android phone with an USB-OTG adapter. I use QSSTV on the PC and an app called Robot36 on my Android phone for SSTV. APRS is a method of transmitting small data packets over radio, most of the time this means 2 meters, and FM. APRS nodes may form a network where each node might repeat certain packets, so they jump from node to node and can cover great distances despite each node being a simple, low-power transceiver. It is most often used to transmit position and some textual information. This can be observed on https://aprs.fi/, a site showing currently active APRS nodes, and lots of information about the network. There is an APRS repeater (or digipeater) onboard the ISS, operating at 145.825 MHz simplex (this is both the uplink and downlink frequency). I also made a video of the contact. I used the radio's internal APRS capabilities. Sometimes, rarely, it is possible to make real, two-way contact with someone onboard the ISS. Usually during such contacts the uplink and downlink frequency is different to prevent interference. In this case uplink was 144.490 MHz and downlink was the usual 145.800 MHz. Good luck chasing the 'station and 73!